For those of you gearing up for a thru-hike of the Appalachian Trail, or if you are hiking it now, you may want to re-familiarize yourself with the American Civil War. 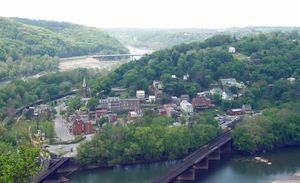 And for all Civil War buffs out there, you may want to consider hiking parts of the A.T.
For starters, Harpers Ferry is the Appalachian Trail Headquarters, and Harpers Ferry was of strategic importance during the Civil War. John Brown’s raid occurred there. Thru-hikers passing through Harpers Ferry normally take extra time to tour the first-class civil war museums in town. I stayed an extra day to see everything and learned a lot about my country. As you hike through Virginia into West Virginia and Maryland, you walk by Civil War battlefields and, from time-to-time, come upon markers, signs, and story boards. The larger pictures you see here, I took on my A.T. thru-hike in ’03. Note how the A.T., with blaze, is next to one of the story boards. I took the picture standing on the trail! The smaller picture is of Harpers Ferry as seen from the Maryland side of the Potomac river. I’m not well versed in this war and had only a layman’s interest, so I didn’t take that many pictures; I could have taken many more as I trekked north. The only picture here that’s off-trail is Stonewall Jackson’s Hdqs., which I discovered in town. I remember having some solemn feelings as I hiked through battle areas and toured Harpers Ferry. I drove back with my wife a couple of years ago to see the area again. If you thru-hike the A.T., plan to stay an extra day or two in Harpers Ferry. This entry was tagged American Civil War, Appalachian Trail, backpacking, camping, Civil War, Harpers Ferry, hiking, long-distance hiking, outdoors, thru-hiking, walking. Bookmark the permalink. Art!! I was not paying attention. Hope you are well. Thanks very much. Happy trails! !